Keeping step with 22-year-old distance runner Jen Fazioli is no easy feat — nor easy on the feet! The Averill Park native, and first-year grad student at Penn State, won the women's division — breaking the 15-year-old course record — and claimed a second place overall finish among the 500 competitors in her first-ever marathon on October 13. The 26.2-mile race marked the 20th running of the Mohawk-Hudson River Marathon. The mile-markers brought even bigger milestones for Jen as her time of 2:47:22 automatically qualified her for the Olympic Trials in St. Louis in April 2004. "I wasn't initially going to run the Mohawk-Hudson race," she said. "I was planning on running the Boston Marathon next April to try and make the Olympic trials. I was running 75 miles per week at school and the runs were well paced, but I hadn't done any speed workouts. My goal was to keep a regular training schedule, but with school, I didn't really have time for leg work or speed work." Jen decided to enter the marathon when she found out she had a long weekend off from school. "The course is local, which is nice," she explained, "and, it's well run in terms of administration. It's a fast course due to the flat terrain and it's also run at a good time of year. So, it's a great course to attempt to qualify on." Jen's interest in running was inspired by her father, who took up running to stay in shape in 1982. She accompanied him to his races and decided to compete in the Freihofer's Run for Women 5K in 1990. When she wanted to do the race, he told her that she would have to get used to running before the race. "I trained with my dad throughout high school," she explained. "We 'connect' most when we're running, and he's been my coach as much as anyone else. I had 'official' coaches — and I listened to them and respected them — but my father's voice was always there. He knew me and my running style better than anyone." In sixth grade, the Averill Park High School cross-country coach, Mark Mindel, approached her regarding joining the team, so in seventh grade, she began running seriously and competing at the varsity level. Even at that tender age, she knew she wanted to run marathons, however 5K races are the longest distances students can run in high school. "I was always a better distance runner, than a sprinter," Jen explained. "I didn't have the leg speed to run sprints." 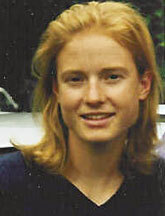 Jen was a member of Averill Park's two-time NYS Class B state cross-country championship teams in 1995 and 1996. Before graduating, she became a three-time state champion cross-country runner and was an All-American (10th place) finisher at the 1995 Foot Locker Nationals, where she was the top placing sophomore in the country. Jen competed in the 10,000-meter distance throughout her undergrad years at the University of Colorado where she pursued history. At Penn State, Jen is working on her master's degree in industrial and labor relations and is in the process of lining up a summer internship with the NFL. She is interested in collective bargaining and labor relations as a part of what they do — it is what she wants to do in general as a career. She would like to participate in the collective bargaining aspect of sports unions and maybe one day apply that to track and field athletes, but working with any sport would make her happy. Jen has excelled in her educational pursuits as well. She graduated with a 96 average and was 5th in her class at Averill Park High School, and graduated from the University of Colorado with a 3.92 GPA with a BA in history, which she received with honors distinction. She was also a member of the Golden Key and Phi Beta Kappa national honor societies. She is now on a full graduate assistantship at Penn State due to her academic "strength." With a year and a half before the Olympic Trials, Jen can focus on grad school and running. "I'm going to skip Boston [marathon], but I'll continue running 75 miles each week and try to keep my leg speed up," she said. "I don't have a lot of time to train with grad school, but I'll run a few 15K races and some half-marathons to stay in condition. I do some weight lifting for cross-training and I've begun doing yoga recently." While proud of his daughter's achievements on the track and at school, Mike Fazioli is relieved that Jen qualified [for the Olympic Trials] and will not be competing in Boston. "I think she did extremely well, but I'm glad she can wait until 2004 to run another full marathon. She's too young to be running marathons. I really believe you only have a few good marathons in you. I wanted her to run more 10K races and work on her speed first. Marathons take a lot out of your body, and I think she should have waited until she was 25 or 28 years old." "Jen's training went really well this summer, but she missed a lot [of training] when she went away to graduate school," Mike continued. "She got sick 10 days ahead of the race with a cold, fever and chills. The day before the race, she could hardly talk! And, they [race officials] said she looked pale when she entered." Though he disagreed with Jen's decision to compete, he was with her the whole way — emotionally and physically. He rode the race on his bike alongside the pack of guys in the front and was there when she stopped to give her Gatorade and support. "I was always a couple of hundred yards ahead," he explained. "You can't ride side-by-side or they consider it 'pacing' and she could be disqualified." Neither father, nor daughter knew how well she did when she crossed the finish line. "I knew she was the first woman to cross," said her father, "but I had no idea she was second overall. Her slowest mile was the first mile. In fact, she ran the second half of the race 2 minutes faster than her first half time!" "Jen will have to run the [Olympic] trials in April 2004 to qualify, then the Olympics in Greece in August," Mike said confidently. "Why the U.S. does it that way [back to back] is beyond me, but making the Olympic trials at 21 is pretty amazing." Jen's own future aspirations are far less starry-eyed than her father's. "I'm looking forward to the trials, but I don't care about placing," she said matter-of-factly. "My goal isn't to reach the Olympics. I can't dedicate the time to become as good as I'd need to be to compete at that level. "I'm just excited to say that I qualified," she stated. "I would like to run under 2:40 for the marathon, but I would like to do so before the trials as that is the A standard for qualifying and would mean that they [the U.S. Olympic Committee] pay my way." In closing, she said, "I plan to keep running as long as I can." Amy E. Tucker is an Albany-based freelance writer specializing in sports and education.